The process of prepping, packing and moving is very stressful. The good news is that unpacking at your destination should feel much more relaxed ─ you’re in the home stretch. Most of the items on your checklist will be crossed off by this point, but there are still a few things to plan for when the moving truck arrives. Make sure that you or an authorized adult representative will be present to accept the delivery when the moving van arrives. If not already taken care of it, have the balance of your payment ready. The movers won’t start unloading until final payment is collected. Before boxes and furniture come off the truck, facilitate the process by taping a sign to the door of each room (i.e. “Bedroom #1,” or “Jenny’s Room”), and have a map of the floor plan near your front door. It also helps to know how you want to arrange the furniture in each room. You can let the movers know where to put each piece as it comes off the truck. 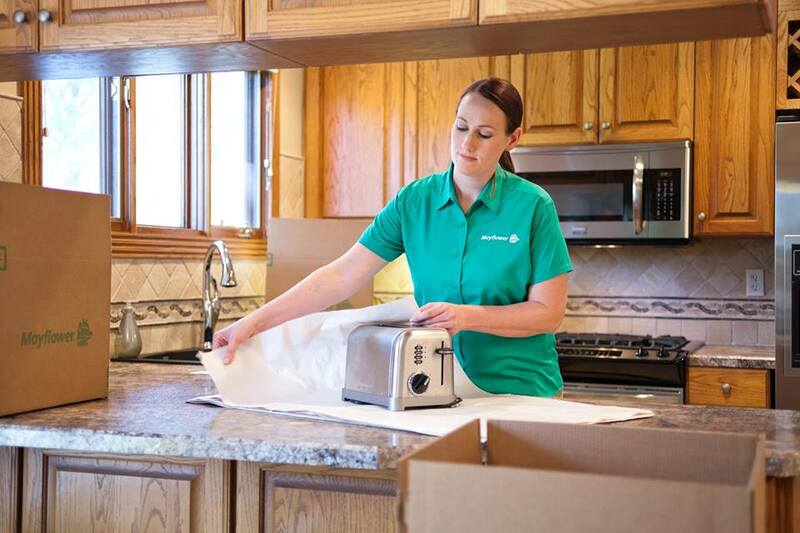 Carefully inspect each of your items as they are brought in and verify that everything is in the same condition as it was when it left your point of origin. Any damage should be noted directly on the van operator’s copy of the inventory when you sign for receipt. If you are very organized and have kept your own written inventory of each box and piece of furniture, you can check items off as they are unloaded. Confirm that your appliances and electronics are in working condition. If you have larger appliances such as dishwashers, refrigerators, ranges and washer/dryers that moved with you, it is recommended that you have a professional technician service and install them safely when you arrive. On request, your Mayflower move coordinator can arrange this third party service for you at an additional cost. Your Mayflower movers will re-assemble your beds for you. Please note that if you would like help unpacking your mattresses, you should check with your Mayflower move coordinator in advance. Give yourself time to clean up and do any minor necessary repairs before the moving truck arrives. Include the cleaning supplies and basic tools you will need in your first night box, where you can easily get to them. Be strategic as you are unpacking. For most people, it makes sense to start in the kitchen. That way, you will be able to feed your weary helpers at the end of another long day. After the kitchen, focus on unpacking the bedroom(s) and at least one bathroom. You will be much more comfortable after a shower and a good night’s rest in your own freshly-made bed.